The 9 Best Hotels and Resorts for Families in South Carolina! Given South Carolina’s miles of beautiful coastline and abundance of mountain views, hiking trails, and outdoor activities, it should come as no surprise that the Palmetto State is a top vacation destination for families. There’s never a shortage of kid-friendly activities, especially since a large metro area is never more than an hour’s drive from anywhere in the state. Pack your bags and head to one of these nine best resorts and hotels for families in South Carolina. While you might not find the likes of Mickey Mouse or Goofy roaming the grounds, you will find that experiencing Disney magic is alive and well outside of the theme park. Kids will spend hours in the Big Dipper pool and zooming down the waterslide, while moms and dads will love direct beach access with more than 12 miles of coastline that feels more like your own private island. The resort offers classes and activities for kids, dolphin excursions, guided nature walks, and DVD rentals to keep your itinerary anything but boring. From vibrant decor to breathtaking ocean views, it’s easy to see why thousands of families have made Dunes Village Resort an annual beach tradition. 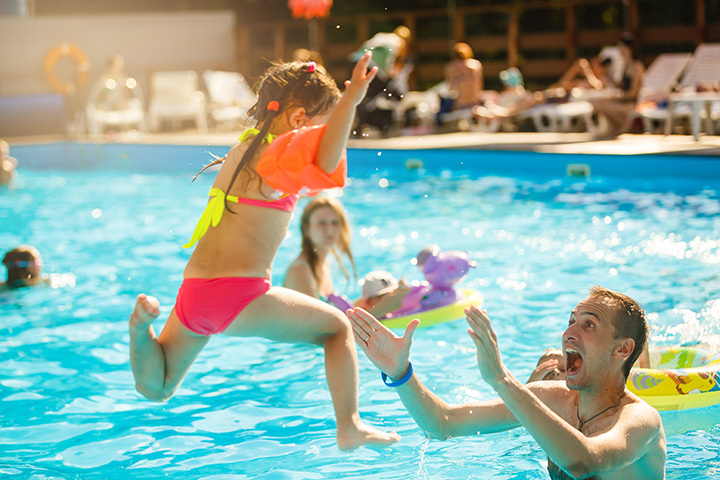 Offering Myrtle Beach’s only indoor waterpark, children can also join the fun in the Kid’s Club that engages them in treasure hunts, arts and crafts, and more. They have an on-site playground area for dry fun, as well as a host of planned activities throughout the season that everyone in the family can enjoy. Edisto Island is a hotspot for wildlife viewing and unspoiled shoreline, and families can enjoy both at Wyndham Ocean Ridge. On-site amenities include outdoor pools and hot tubs, mini golf, playground, grilling areas, movie rentals, and bicycle rentals to ensure you never run out of things to do. Part campground, part traditional accommodations, this is the prime locale to truly get away from it all and focus on family time. Set against a backdrop of the Sumter National Forest, families can spend the day hiking in search of waterfalls or drift down the nearby Chattooga River. They also feature the only full-service restaurant and bar in town, so no need to go anywhere else. Situated right on the beach, you and your family can start the day with stunning ocean views before heading down to one of the many on-site amenities, such as the game room or lazy river. They also include free access to their on-site mini water park, complete with a slide, drench bucket, and a water-shooting serpent. You can grab breakfast, lunch and dinner at one of several lounges and bars, which means you may never have to leave the property. This resort offers a variety of rooms and accommodations to suit families of every size. From kitchens and fireplaces to private bedrooms and generous bathrooms, you have your pick of condo or detached home to enjoy your stay. Take advantage of the spacious pools, direct beach access, on-site restaurants, and bicycle rentals. Just minutes away from the Cherry Grove Pier, Towers on the Grove was built with families in mind. With direct beach access, outdoor pool, lazy river and waterslide, kids will never want to leave. You can also take advantage of clean outdoor gas grilling spaces and picnic areas for a little extra family time. Far from the typical hotel room, each rental takes the form of a villa or cottage that provides every comfort of home, including private washers/dryers, fully outfitted kitchens, DVD player, and professionally curated decor. Aside from the beauty of both the rooms and the property, families can enjoy on-site beach access and tennis courts, along with nearby shopping and other activities Hilton Head Island has to offer. Located right on the main waterway in Charleston, families can expect the perfect blend of fun and relaxation. They feature a bocce ball court, outdoor pool, private beach, and a host of other family friendly activities to keep everyone in the family entertained. It’s also just minutes away from many historical landmarks and shopping areas that dot the Holy City landscape.